Living in central NY it is starting to get cold out. This time of the year I like to make different hot chocolates for the kids. 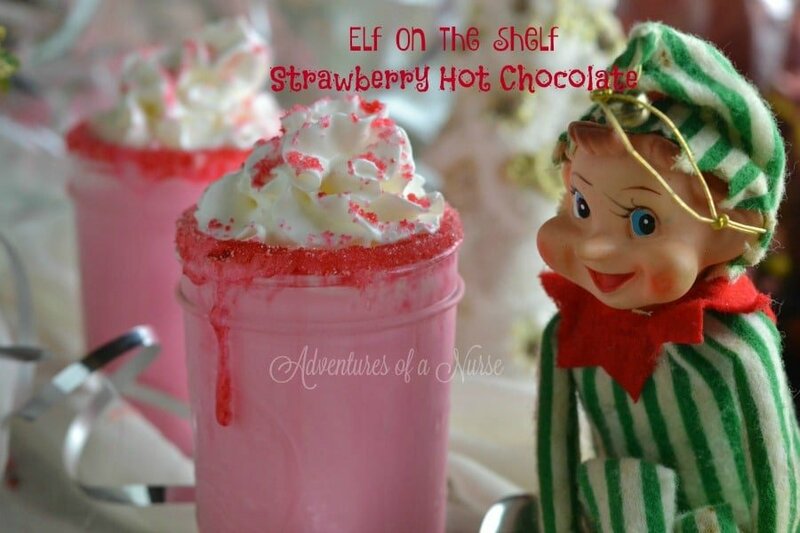 I love to throw in the Elf on the Shelf to make this an extra special dessert for the kids. 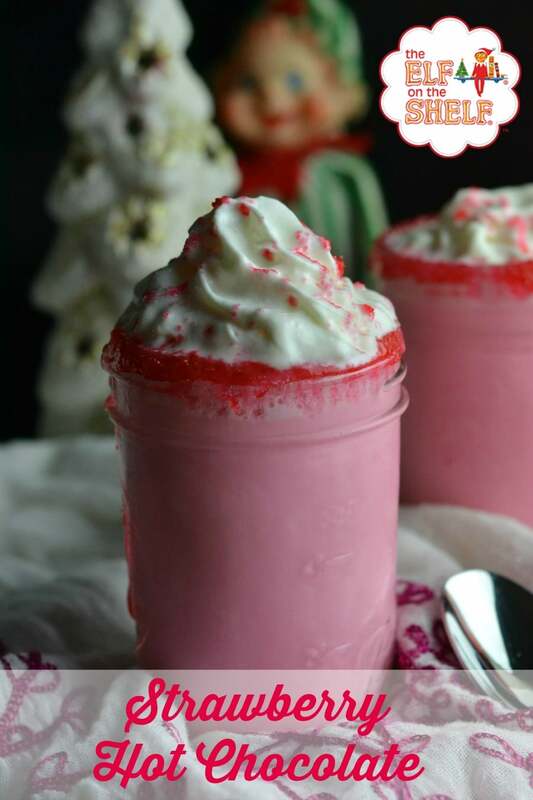 This is the perfect drink to make on Christmas Eve when the kids are waiting for santa. This sounds so good. I am not really a strawberry-person, but I do like to eat them every now and then. But blended together and put into a smoothie – yum. Now I do like chocolate – so that is why I would try it. Thanks! Looks Super good!! Our Elf Skadoodle just rolled in today!! Mmmm this looks so yummy! Not to mention cute too! My kids and nieces and nephews would go crazy for this!!! Maybe I’ll try it in a couple weeks at my son’s birthday party! I’ve never thought of adding strawberries to hot chocolate. Why not? We eat chocolate covered strawberries! This sounds really good. I always just have the regular hot chocolate. I like that this recipe just has simple ingreditents in it. My grandchildren would love this, they love strawberries. I think my niece would go crazy over this! I love that this has real strawberries in it. I was expecting something icky like Strawberry Quik. I would absolutely try this, and my kids would love it. It would be good with raspberries, too! wow, this looks amazing, am going to be trying out this recipe right away!!! This looks delicious, my girls would love it. This sounds delicious. Elf on the Shelf is a fun Christmas tradition. This sounds like sUch a delicious combinaion. I want to try it. We will have to do this on Christmas Eve. Wow. This sounds so good. Great for stay over at Grandma’s night. My granddaughter loves strawberry milk bet she would love this. my daughter would love to try this recipe! we’ll be making this christmas eve. 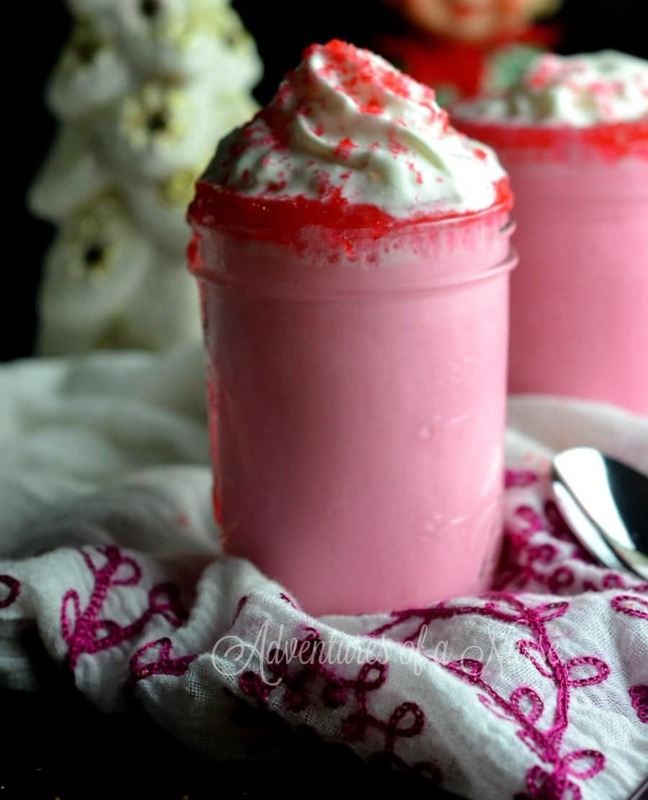 A strawberry hot chocolate sounds so thrillingly delicious right now. I would love to try this out. Strawberries and white chocolate is a combination that I’ve always loved….this looks so delicious!